When moving your belongings whether valuable or otherwise, it’s important to utilize proper packing materials to ensure nothing gets damaged when going into storage or while moving into a new home. However, not everyone chooses to go the traditional route when packing up their home. For those who don’t have proper packing materials, we’re taking a look at alternative packing supplies you can find right at home. Before you throw them into recycling, you can use newspaper for wrapping and stuffing. It will come in especially handy for fragile items like glass or ceramic. Magazines work just like newspapers and you can crumple them to use as separators for your fragile items. If you’ve got worn or old clothing lying around, you can use them as fillers or even wrapping. These would also come in handy for fragile things. Even if they are good clothes, wrapping them around other items is an efficient way to save space and time. Junk mail works just as well as magazine paper, and because it’s rubbish it won’t cost you anything to use them for wrapping or stuffing. Shredded paper comes up next on the list of filler items. They fit smoothly between items and can be easily discarded. 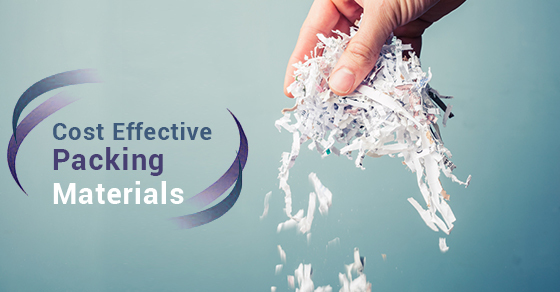 Just ensure that the paper used doesn’t have confidential information. It may not be quite the same as bubble wrap, but once you fill it with air they have the same effect. For boxes that aren’t quite full, this is an inexpensive alternative for packaging. Linens can be used to wrap much larger items like picture frames. Make sure you clean the items to be wrapped. You don’t want to have to wash stains off of them when it is time to unwrap them. You can place pillows at the top of the box to keep the items below from bouncing around. It is good filler if the box is not yet full. It is especially useful for items that cannot be turned upside down. If you have non perishable food wrapped in plastic bags (like chips or other air-filled bags), then these actually make good fillers. They can help prevent items from shifting, but make sure that they are not mixed up with sharp items then can prick the bags and cause the content to burst. Use food items that you won’t need immediately when you make the transition to the new place. If you are not moving these items to their final destination immediately, then public storage is the ideal choice for transition. There are a number of different facilities to hold your items no matter what the quantity, and you’ll be able to have a permanent location for bulky items or ones you currently don’t have room for in your new location. For more tips and tricks in packing effectively, contact the Jiffy Self Storage team today!